Janaar, Tomi, Sergio, Caleb and Richard. A closer look at 5 interesting players on 5 different positions with experience ranging from MSL to La Liga. From Liverpool youth ranks to Estonian Champion, from a goalkeeper to a striker. First Fieldoo weekly featured players roundup boasts with a wide range of players with plenty of experience and potential. The list is accompanied by two interviews and videos from their Fieldoo profiles. Janaar is a quick right winger with great crosses who currently plays for Estonian top division club Nomme Kalju and has recently scored a belter against Maccabi Haifa in the UEFA Europa League qualifications. 1. Describe yourself as a footballer and your first memory of football. As a football player and a person, I’m always trying to improve myself. This makes things more interesting and keeps me motivated. My first memories of football are from the first day my friends invited me to join them at the training session. We played indoor and our goals were made of some old benches. 2. What is the most important quality of a winger? The most important quality of a winger is the ability to create chances for scoring goals and also finishing. 3. When did you join Fieldoo and who would you recommend it to? I’m a Fieldoo member since January 2016 and I’d recommend it for everyone who’s interested in making new connections. 4. Where would you like to play in the future? My dream is to play in a top European league because I enjoy playing against good players and big clubs. Performing well in these games gives me a lot of satisfaction and motivation to keep working hard. 5. What is your advice to young players trying to make it? My advice is to educate yourself about the basics. Knowing how to take care of yourself gives you stability and then it’s just important to be focused and work hard. 6. What is your most memorable football moment on the pitch and one you’ve seen on the TV? At the moment it’s the goal against Maccabi Haifa. This game was very important and scoring there gave me a lot of emotions. I remember well when Andres Iniesta scored in the 93rd minute against Chelsea in the Champions League semi-final 2008/2009. This was the only shot on target in this game, but it always reminds me that you need to believe in your game until the end. Tomi has started his career in the famous Chelsea’s youth ranks and went on to help Levadia Talinn win the Estonian championship in 2009 thanks to his defending skills . 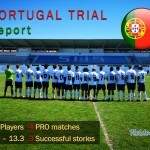 Ricardo Quaresma, Nemanja Matić, Enzo Perez, Jackson Martinez – these are just some of the players Sergio has competed against in the first Portuguese division. Quite a few experiences for a relatively young player. Check his skills below. From Liverpool youth ranks to New York Red Bulls, an experienced goalkeeper of ideal height, who is currently playing in Portugal. A hard working and universal midfielder with plenty of experience from Spanish leagues (from La Liga to Segunda), known for producing great midfielders with superb technical skills. 1. What is the most important quality of a midfielder? The most important thing would be to have good control on the ball. Be the engine of the team and work extra hard to regain a lost ball. 2. 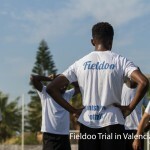 Where would you like to play in the future and do you think Fieldoo can help you with that? It’s my dream to play in The EPL or in Sevilla FC. And I think with the exposure Fieldoo gives affiliated members it can be possible someday. 3. What is your advice to young players trying to make it? Never give up. Hard work and determination will pay off. It’s not always as beautiful as it seems. Sometimes things might turn sour but giving up is not an option. 4. What is your most memorable football moment on the pitch and one you’ve seen on the TV? My last game of the last season when I provided 2 goals for the win. The goals came at a crucial time and I’m glad that I was part of the winning team. Also my first appearance in the La Liga on the 28th February 2014.